Join a gay group trip and explore Argentina and Chile. You’ll visit the Argentine and Brazillian parts of Iguazú Falls, watch a tango performance in Buenos Aires, visit the grave of Evita and explore the Andean landscapes of Chile. This is a great way to discover two of the most enigmatic countries in Latin America. 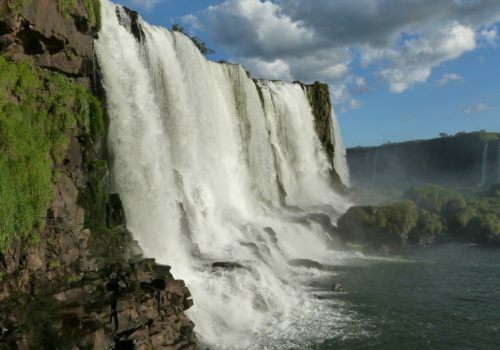 You’ll be transferred from the airport in Buenos Aires to Iguazú Falls. When you’ve checked into the 5-star hotel in the jungle, you’re free to enjoy the spa facilities and relax. In the evening we’ll have a welcome dinner. This morning we’ll head over the Brazillian Falls and cross the catwalk down to Devil’s Throat. After lunch we’ll return to the Argentine side and explore the other side of Devil’s Throat. We’ll even hop on a boat for a high-speed past the waterfalls. Today we’ll fly back to Buenos Aires. We’ll be staying in the trendy Recoleta District. In the evening we’ll see a Tango Rojo dinner show at the Faena Hotel. At the Recoleta Cemetery, we’ll visit the grave of Eva Duarte (Evita). We’ll also visit the Evita Museum and learn about the controversial life of Argentina’s most iconic historical figure. In the afternoon we’ll drive through Palermo and visit the trendy Palermo Soho & Palermo Hollywood districts. In San Telmo we’ll get a glimpse of the old Buenos Aires. Strolling Plaza Dorrego we’ll hear tango singers and visit the vibrant San Telmo Antique Fair. Today we’ll visit Teatro Colón, the famous opera house. We’ll also visit the huge bookstore, El Ateneo Grand Splendid located in the Recoleta neighbourhood – The Guardian hailed it as the second most beautiful bookstore in the world. In Avenida de Mayo we’ll visit Café Tortoni, favoured by the city’s cultural movers and shakers. We’ll fly to San Carlos de Bariloche in the Andean foothills. We’ll explore the town and then take a chairlift right up to the summit of Campanario Hill. Today we’ll head north to Manzano Port. At town of Villa La Angostura, we’ll be surrounded by many sites of great natural beauty. In the morning we’ll fly to Chile. We’ll sail the Nahuel Huapi Lake on a catamaran and continue to the Vicente Pérez Rosales pass – at this point we’ll cross into Chile. At Peulla we’ll have lunch, then we’ll sail Todos Los Santos and pass the Osorno volcano. From Petrohué we’ll proceed to the Petrohue rapids. We’ll spend the night in Puerto Varas. Today we’ll fly to Santiago de Chile. We’ll check into our hotel. In the evening we’ll have a farewell dinner at the Como Agua Para Chocolate restaurant.